Recently a 1950s Bobby Layne Detroit Lions was included in an auction. The shell appeared to be gold. Did the Lions ever wear gold colored helmets? This is a great question and our answer may be challenged by readers who believe differently. It is our humble opinion that although some pictures of 1950s Lion's helmets seem to indicate otherwise we believe that the team never wore gold colored helmets on the field. Some fans believe the Lions wore gold helmets to commemorate the multiple NFL championships the team won in the 1950s. The Lions have primarily used Riddell helmets since the late 1940s. Up until the late 1950s the Riddell helmet shell was made from a clear or see through soft plastic material trademarked "Tenite" by the company. This helmet was referred to as the "RT" or "Riddell Tenite" model. (In the early 1960s Riddell changed their helmet model name to "RK" or "Riddell Kralite" when they switched to a non clear harder plastic material they trademarked "Kralite.") The earlier 1950s clear plastic "Tenite" shells were painted at the Riddell factory on the inside surface of the shell prior to installing the interior suspension. It is interesting to note here that Riddell used clear shells painted on the inside surface long before helmet companies such as Macgregor, Kelly or Maxpro featured the same technique. The clear soft "Tenite" plastic shell would yellow as it aged. After years of aging the original brilliant silver luster Lion's helmet appeared to turn gold when the highly reflective silver paint was viewed through its yellowing but still translucent plastic shell. If you look at the center ridge of a 1950s Lions helmet it will still appear silver compared to the remainder of the helmet which has seemingly turned gold. Regardless of aging the center ridge retains its original silver appearance because it was originally a separate strip of non clear plastic that was painted silver on its exterior surface. Riddell used this plastic strip as a trim piece to cover the joint where the two halves of the helmet shell were glued together. Here is some interesting additional information regarding the 1950s Lion's helmets. In the early 1950s NFL teams played several night games and a white colored football was used. The league barred the Lion's from wearing their silver helmets for night games because they felt the white ball when viewed under stadium lighting was too easily camouflaged by the Lion's silver helmets. To comply with the league ruling the Lions painted their helmets blue for night games and then repainted them silver for daytime games until 1955 when the white colored night football was replaced by the conventional brown leather football for all games. The face mask you are referring to was manufactured by Riddell in the mid to late 1950s. It was a factory modified version of their famous one bar face mask. The modified version was a single plastic bar that looped upward in the shape of a rounded inverted "V" towards the middle of the mask in an attempt to provide additional protection to the nose area. The mask was short lived because of the introduction of the Riddell "BD-9" two bar in the late 1950s. In addition to Joe Perry, Forty Niner great Monty Stickles wore this mask while at Notre Dame and Alvin Wyatt unbelievably wore this mask into the early 1970s while playing for the Buffalo Bills. This rare mask is full of 1950s era character and remains a great collectable from that period. I can't get enough of this site! Quick question I have noticed in numerous pictures that the Gold helmets of the Niners looks different, is this just lighting or did they change shades? Do they have a name? Niner Gold? When and why did they change? Dear Big Fan Jason (we love your name)! The Forty Niners changed the style and color shade of their helmet in 1996. The resulting helmet is now a darker shade of gold and the contrasting trim color has also changed from plain red to dark red. The color of the paint is referenced by a number code according to Riddell All American who paint the helmets for the team. The logos and striping design were also slightly modified. When the new helmet design was originally being contemplated team ownership wanted to eliminate the existing "SF" logo and replace it with a logo that focused instead on the "49er" nickname. There were rumors that this was being done because ownership was considering to move the team to a new stadium in the suburbs of the San Francisco and did not want a logo that only reflected the city of San Francisco. (For similar reasons the New York Giants changed their famous "NY" logo to "GIANTS" when they relocated to nearby New Jersey in the 1970s.) When the loyal Forty Niner fans found out about the proposed new "49er" logo they rebelled strongly against it causing ownership to adopt only a slightly modified version of the beloved previous logo. It seems we need that same type of fighting spirit among the fans in other NFL cities. Are you listening Atlanta, Buffalo, New England and others? dungard (like Larry Csonka's) bolted just above it at eye level? I've never seen a photo of it, but I definitely recall straining to figure it out on TV back then. Any info or pic would be appreciated. As always I enjoy the site and keep up the great work. Your observation about a 1970s Ram's offensive linemen wearing two Dungard face masks at the same time ("Page" and "Csonka" style masks) is correct however the player was John Williams (number 75) not Jackie Slater. 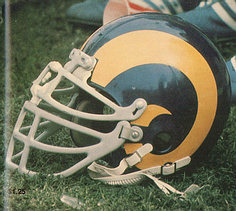 Ram's equipment manager Don Hewitt mounted the additional "Csonka" style mask in a higher than normal position and over the "Page" style mask to provide extra protection to William's eye area because he was suffering from repeated scratched corneas due to opposing player's hands penetrating his regular mask. This custom face mask configuration was just as comfortable for John to wear because the two aluminum frame Dungard masks were similar in weight to his previous single conventional Schutt steel frame mask. Today's players who have eye protection problems use the plastic eye shield which was introduced in the 1980s a few years after John Williams retirement in 1979. As Paul Harvey might say "now for the rest of the story:" Today Dr. John Williams is a dentist. The only known player to ever wear two Dungard face masks at the same time now practices the same profession as the inventor of the Dungard face mask Dr. Dunning who was also a Dentist.